More and more bear had been coming out of the water and the trolling boat was heeling and taking in an ocean at a gulp. With a mournful wail the fisherman cried, "It vas a brownie!" The officer needed no confirmation. The brutes head, hair plastered down with water  and naturally small anyway, had been wholly deceptive. Streaming and roaring, the brownie got aboard and dived for the officer. The officer had no wish to match blows with three-quarters of a ton of Kodiak and dodged back around the lump of a pilot house which stood out of the deck. The bear making the little boat rock as though a hurricane had hit it, lunged in pursuit. The bear held a grudge because he did not like to be towed at four knots. "Come in!" screamed the fisherman, meaning the officer, not the bear, and yanked his human passenger into the pilot house. Together they got the door solidly bolted. The brownie bent over and glared through the ports of the house; the ports were too small to admit his paws. He buffeted the structure for a while and then, failing to make an impression, gave it up. Besides, he was tired. He went aft by the fish hatch and sat down, thus bringing the bow out of the water. He panted and clawed at the rope about his neck and cast occasional promises toward the pilot house. Below, the fisherman was bailing madly in an attempt to keep the small vessel from swamping but the water was already up to the carburetor and coil of the engine and more came in steadily. They decided to let the tide carry the boat near some rocks ahead, in the hope that the bear might feel some gratitude for having been ferried there and so go ashore and leave them. Slowly they drifted to the rocks, slid up on one and were held there by the current. 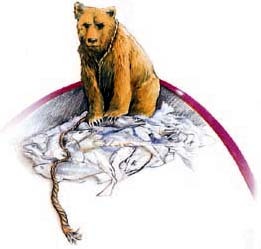 Belatedly it occurred to the men that the bear was still tied to the boat with a nice, strong rope, and if he was to be put ashore something would have to be done about untying him. The fisherman opened the door a crack. The officer edged slowly toward the cleat and the rope. With a roar and a lunge the bear remembered his revenge. The officer scuttled back, got in, and the bear hit the door. The movement of the brownie made the boat heel to the starboard and water began to pour in with renewed fury. 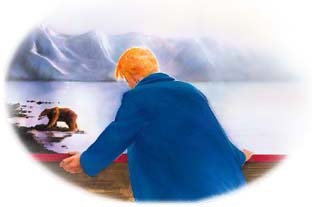 It was certain that if they had the bear another hour they would have to give him the boat. The tide went slack and then began to run the other way. Evening approached and with it a wind. The officer and the fisherman took turns at the pump and, by strenuously continuing the operation, were able to keep the water from completely drowning the engine. This could not go on forever, they decided. Finally they had an idea. They took a pike pole which could be reached from the pilot house port and to the end of it lashed a long, sharp knife. Then, moving slowly so as not to attract the ire of the brownie, began to saw through the line by this remote control. But when the line was parted the brownie made no effort to avail himself of the fact. He was not grateful. He had calmed considerably and had become interested in the delicious odor of fish which assailed his nostrils. Finally he located the source and with one tap of his paw knocked the top off the fish hold. There he found a number of beautiful fish and proceeded to take one bite from the belly of each, casting the thirty-pound remains overboard. It was dark now and the tide was falling and soon the trolling boat would be left high on a reef, from which it would probably fall, with no good consequences to itself or anyone aboard. Desperation caused the two exhausted men to peg chunks of coal at the bear, who had now begun to doze. The first few blows went unnoticed but finally the bear roused himself, gave the pilot house a final rush and then, stalking angrily, stepped to the rocks and went ashore. The men were glad to see him go. They managed to get the water out of the boat and get the boat off the rocks and the engine going once more. And then they went home. Now that, gentlemen, is the full and true account of my  of the incident of the bear. It is a lie that anybody broke the bears heart or that the bear wanted to kiss anybody. It is also a lie that anybody showed the slightest inclination to wrassle that bear. And any songs written about it, and any puns made about it, are libelous. It is enough to be teased about it in Alaska without being teased about it here. In short the whole thing is a damned lie!